Floating on land – For the fainthearted . . .
To a schoolboy, the pumping stations seemed like battleships in hostile waters, protecting the farms and the villages against the rising floods. They seemed always there; although a second thought about the buildings would have told even someone who knew nothing of architecture or engineering that they were recent arrivals on the scene. 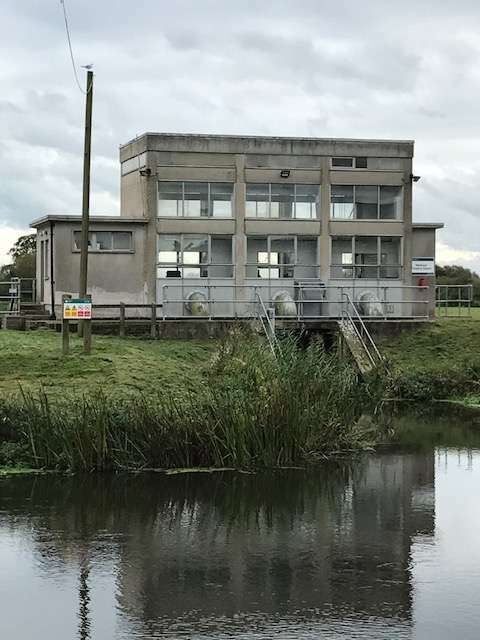 A government website says they were built in the 1960s and that there are twenty-one pumping stations in Somerset. Prosaic in appearance, the grey concrete and steel adding to the childhood impression of their being like naval vessels, they possessed a sense of mystery for someone who would rarely pass a day without seeing one of them. 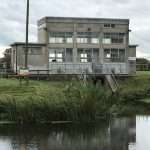 The pumping stations seemed always to be isolated, probably a not unreasonable impression. Even the one at Westover, on the edge of the town of Langport, seems to stand at a remove, as though it were keeping a respectful distance from the other buildings of the town. Of course, given that its work is flood prevention, it is hardly likely anyone would have built on the hinterland of a station; were there a pumping station at the end of a street, the street would be in the wrong place. But it was something more than just the location, it was the absence of people. The pumping stations seemed to suggest a human presence would be appropriate, they were built with two storeys and an abundance of windows, as if a passer by might see staff sat at desks, busy with their work, but it was rare to see anyone in the vicinity of the buildings. Logically, one would only expect there to be staff at times of flooding, but why were these structures built as they were if they were to stand empty for most of the year? More than that, the pumping stations seemed to capture the spirit of the place. Like buildings on a seashore, they stood at the margins of dry land and water. The Somerset Levels are lands claimed by hard work; they are flatlands that were once bog and marsh, expanses of wetness, tracts of water. They are still summer lands from which herds might be withdrawn when the winter rainfall comes. Like the childishly-imagined battleships that were guarding a coast, the pumping stations represent a battle to hold on to the land dear to those who work it. Farming on the Levels is very different from that in many places; it is always marginal and always demanding. In 2005, the Labour government environment minister Elliott Morley decided that the Levels should be allowed to flood in order to preserve wildlife. The floods of 2014 came as a consequence of that decision and brought a determination that the way of life of those who live and work on the Levels should not be sacrificed. The pumping stations declare that the land will not be taken.